Ooooh ... this reads like the list of DVDs I'm currently inflicting on my children in the absence on anything "proper" on telly these days! Thanks for posting these images, looks like a nice set! Looks like going to be an(other) epxensive year though - twelve! 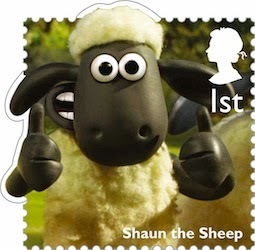 1st class stamps - will it be the new norm I wonder? 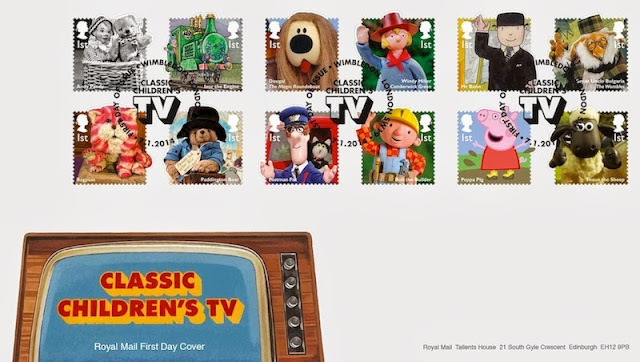 Really loving these stamps, some notable ones missing though, Captain Pugwash, Willo The Wisp, Roobarb & Custard, I would have been more interested in the old childrens programmes instead of recent ones, like Peppa Pig, looking on the bright no Teletubbies. Ah, Willow, and Mavis Cruet. Peppa Pig and Shaun the Sheep do bring things right up to date,and are sure to sell well, judging by the Peppa toys seen everywhere! 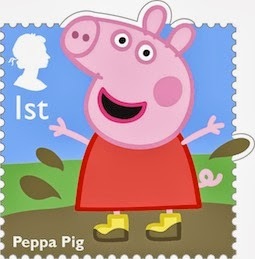 I think that it is worrying that Royal Mail have stepped up the number of stamps in this set from what has generally been 10 stamps per set. Equally bothersome is the fact that they are 1st class values rather than second class although we were promised that we would have more 2nd class issues but we know from what has happened during 2013 that very few actually appeared. Clearly they have seen what was acheived with Dr Who and want more of the same. Although these will be popular they will not repeat the success of Dr Who because that was a special case with a huge fanbase that like to collect anything associated with the programme. Having been amazed that they still issue sets of 10 after the 60p price rise for 1st class, I'm speechless that they think 12 is OK to bring it to an eye-watering £7.20 for a set. We really are getting to the stage now where these sets are aimed at one-off sales rather than the "buy one of everything" collectors. As you see from an earlier comment, some popular favourites were omitted - Bill & Ben, Captain Pugwash, Willow the Wisp. So how do they get the long list down to a short list? Even allowing for any copyright-holder to say no (why would they?) we could still come up with maybe 20. So should they have had a time-frame cut-off? Maybe stop in the 1980s or earlier? Well, some of the 1990s-current characters are even more popular with today's children, so that would not have been a good move. 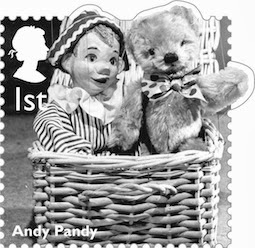 Or start later and forget Andy Pandy, and Ivor? Then there would have been as many complaints from collectors - who are mainly in the older age-group - that their classic favourites had been omitted. Ian - unless it's a problem with my Internet, I can only see four images. Can you provide a text list of all twelve characters? No, I'm currently only showing four stamps. No Dangermouse.... Was listening recently to David Jason about Cosgrove Hall Films on the radio.... Dangermouse even beat Coronation Street in the ratings! 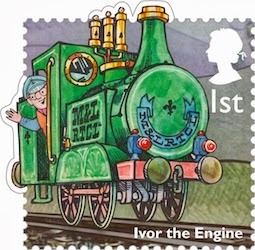 Still, I love Ivor the Engine! I heard the same programme today on Pick of the week today. Dangermouse should have been in. 21million viewers! 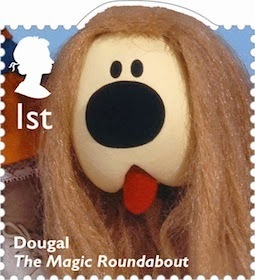 True, but Danger Mouse featured on the 43p stamp from the 1996 Children's Television set. 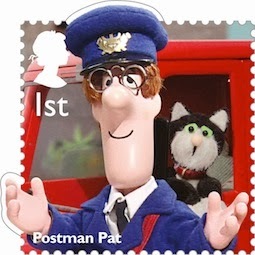 They could have had a better balance between BBC (11 stamps) & ITV/CH4/Channel 5 (1 stamp). In fairness they were never going to please everybody with this issue. Nice set, worth to collect in 2014. 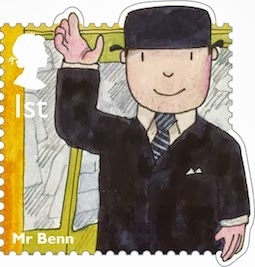 How much 2nd class & Ist.class stamps cost now in UK ? 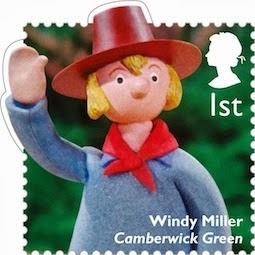 1st class stamps are 60p so £7.20 for the set. 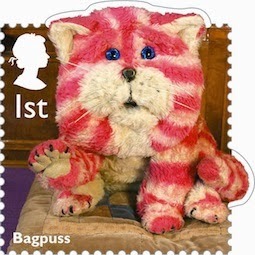 2nd class stamps are 50p. Expect a review in March when prices are likely to increase. Does anyone know if this set will be produced on 2 separate covers, as its looking most likely with 12 stamps to the set, looking at the Dinosaurs set, it seems to be going that way just like the UK A-Z series. Sorry Martin, FDC now added. 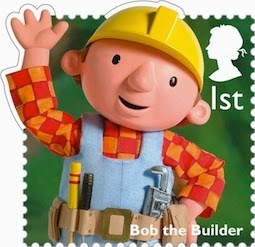 As these stamps are not too large at 25 x 25 mm plus throw-outs, I think the standard size FDC will be OK. 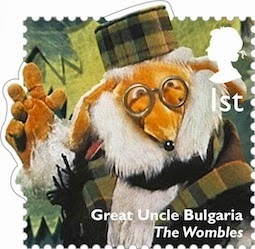 Interesting though, the Christmas stamps were 24 x 28 mm. 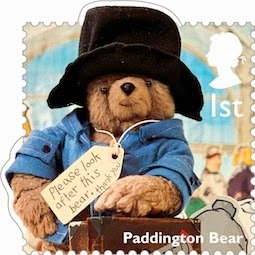 Paddington Bear was also on the 1994 'Messages' greeting stamps so this will be his third appearance!